President Donald Trump will propose boosting defense spending by $54 billion in his first budget plan, offset by an equivalent cut from the rest of the government’s discretionary budget, according to administration officials. Most federal agencies other than those involved in security will see their budgets reduced to make room for 10 percent higher spending on defense, said the officials, who briefed reporters on condition of anonymity. The cuts won’t affect entitlements, including Social Security and Medicare, which make up about two-thirds of the $4 trillion federal budget. Trump has said he won’t touch either program. In remarks to governors Monday at the White House, Trump called his plan a “public safety budget” focused on increasing law enforcement and keeping out terrorists. He also promised that “we’re going to start spending on infrastructure, big,” without giving details. The White House is sending budget targets to federal agencies on Monday, a day before the president is set to deliver an address to a joint session of Congress in which he’s expected to outline his priorities for the nation. The administration plans to have a fuller budget outline next month, and it’s certain to come under intense criticism from Democrats and potentially some Republicans as favored government programs are slashed. The budget is rooted in Trump’s campaign promises, Office of Management and Budget Director Mick Mulvaney told reporters on Monday. If Congress were to adopt Trump’s plan it would mean that everything else government spends on discretionary programs outside of national security -- including medical research, veterans care, education, national parks, food and drug regulation -- would have be cut on average by about 10 percent, though some programs might be cut more and some less. 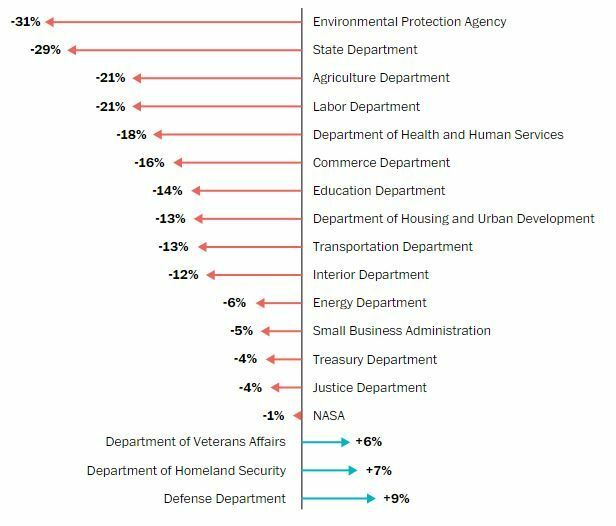 The State Department and the Environmental Protection Agency are targeted for cuts in particular. 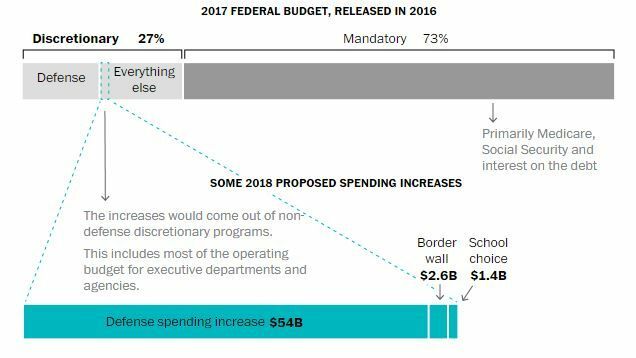 The White House budget is mostly an opening bid in what could be a protracted process to set a federal budget for the upcoming fiscal year. Congress approved $543 billion for non-defense discretionary funding for fiscal 2016 and $607 billion for defense. Those totals currently are set to be reduced by 2018 under the budget sequester law, which Congress would have to amend in order to pass Trump’s spending plans. That process would give Democrats, who’ve opposed cutting domestic programs, an opening to thwart Trump’s plans. Stan Collender, a federal budget expert at Qorvis MSLGROUP, said cuts of the magnitude Trump envisions wouldn’t necessarily “eviscerate” federal agencies, unless individual ones were targeted for deeper cuts. But he said the impact would be significant. “This is not waste, fraud and abuse -- this is like lopping off a right arm and a right leg," Collender said. Senate Democratic leader Charles Schumer of New York said Trump’s budget would take "a meat ax to programs that benefit the middle-class." "A cut this steep almost certainly means cuts to agencies that protect consumers from Wall Street excess and protect clean air and water," Schumer said in a statement. Senate Armed Services Committee Chairman John McCain, an Arizona Republican, meanwhile argued that the military spending increase wasn’t big enough for "a world on fire." The House Armed Services Committee Chairman, Mac Thornberry of Texas, also criticized the increase as insufficient. Veronique de Rugy, a senior fellow at the Mercatus Center, a think tank funded by the conservative Koch brothers that is affiliated with George Mason University in Virginia, said Trump should first reorganize the military to meet the threats of the modern world. "The defense budget is blotted with massive amounts of waste and spending that respond to the military needs of a world that doesn’t exist anymore," de Rugy said. "The new injection of funds will once again be allocated based on politics or outdated priorities rather than national security concerns." Trump’s budget outline will show the president’s “commitment to fixing VA,” Veterans Affairs Secretary David Shulkin said in an interview that aired on Fox News on Monday. Shulkin said it’s not about increased funding, but a matter of restructuring the system. The State Department will not share in the largess. One of the agency’s deputy secretary positions, in charge of management and resources, is expected to be eliminated and its staff reassigned, people familiar with the plan said. Trump and his aides also are reviewing whether to eliminate many special envoy positions, the people said -- diplomatic staff assigned to key regions and issues, including climate change, anti-Semitism and Muslim communities. State also handles a substantial chunk of U.S. foreign aid, which the administration officials said is being targeted for major cuts. The EPA, meanwhile, has been a consistent target for Trump. He’s said the agency has too many regulations that burden companies and cause long delays for businesses trying to get approvals for new factories. Trump’s pick for EPA administrator, Scott Pruitt, was a long-time foe of the agency as Oklahoma’s attorney general. Trump is slated to sign documents as soon as Monday compelling the EPA to begin undoing recent regulations, including the Clean Power Plan that slashes greenhouse gas emissions from electricity generation and the Waters of the U.S. rule that defined which waterways are subject to pollution regulation. The EPA is a perennial target for budget cuts for some conservatives in Congress, and advisers on Trump’s transition team said its funding and staff could be slashed below its $8.3 billion budget this fiscal year. Myron Ebell, who led the Trump transition team focused on the EPA, said the agency’s workforce could be cut to a third of its current size. The agency now has about 15,000 employees nationwide. Pruitt declined to say whether his agency’s resources could be sharply reduced during a question-and-answer session at the Conservative Political Action Conference on Saturday. House and Senate committees don’t have to embrace the president’s proposals, as presented. They will hold hearings to establish a congressional budget resolution laying out a framework for anticipated revenues and discretionary spending allocations for the 12 annual appropriations bills for the next fiscal year, which begins Oct. 1. That budget resolution is adopted by Congress, but is not signed by the president. The network's leading groups, Americans for Prosperity and Freedom Partners, announced late Wednesday the creation of a special fund to support House members who vote against the bill. Spokesman James Davis says the current proposal doesn't do enough to repeal President Barack Obama's health care law. He says, "We're going to be there to help these people for taking a principled stand." Davis describes the fund as "seven figures" to provide paid ads and other grassroots support in the 2018 election. The announcement marks the Koch network's most aggressive move against the Trump-backed health care proposal, which is under attack from the right and left.